During the month of April, we’ll be taking a world tour of recent research in Pakistan; Indonesia; Romania; Chile; and Bangladesh—all delivered by Tobacconomics think tank partners. In last month’s series, we explored our approach to think tank capacity building through a series of blogs. This month, we’ll be sharing the proof of concept to highlight several dissemination events that have taken place in the last several weeks. Let’s begin in Karachi! Muhammad Sabir from SPDC presenting their research. 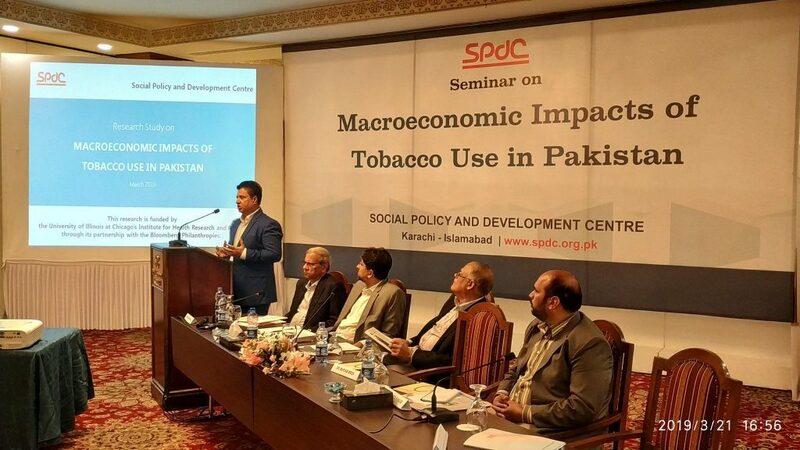 The tobacco industry makes a very small contribution to the Pakistani economy. Despite being one of the largest tobacco growing countries, unmanufactured tobacco production only accounts for 0.42% of the total value of agricultural produce, 0.25% the total area under cultivation, and only 0.03% of agricultural employment (8,200 persons). Similarly, the cigarette industry’s share is 1.1% in large-scale manufacturing and only 0.3% in industrial employment. There is a strong negative relationship between prices and production in Pakistan: as cigarette prices decrease, cigarette production increases. From 2011 to 2017, cigarette prices increased 16% percent annually and production declined by 7.7%. On the other hand, from 2017 to 2018, the decline in the price of cigarette by 22% was associated with a 72% increase in production. This data suggests that an increase in tobacco tax that leads to a significant price increase can play an instrumental role in curbing tobacco use in the country. The three-tier tax structure resulted in a reduction of average federal excise duty (FED) across all tiers by nearly 12%. From 2016 to 2017, the FED was 53.1%, and dropped to 41.4 % in 2017 to 2018. In the lowest-priced tier, the tax rate dropped by 48%. The estimated loss of tax revenue due to introduction of the three-tier FED structure (along with a reduction in the tax rate) is Rs. 42.5 billion between 2017 and 2018. Thus, this change in tax policy not only led to a significant increase in the consumption of cigarettes, but also resulted in substantial revenue loss of over 50% compared to the previous year. Although a reduction in tobacco consumption may lead to small short-term losses to the economy, there are significant gains in the medium- to long-term. Estimates show that a 10% increase in price will lead to 11% reduction in cigarette consumption, translating into annual savings of Rs. 16 billion by individuals. Reduction in cigarette consumption would allow individuals to spend their savings on other household necessities, such as food items, which would lead to a net increase of Rs. 40 billion annual output of the economy. Mahmood Khalid from PIDE presenting their research. Around 45% of the households in Pakistan consume tobacco. Cigarette consumption is at 26%, and chewed tobacco is 13%. The prevalence rates of cigarettes, chewed tobacco, and overall tobacco consumption are all higher in the rural areas of Pakistan. 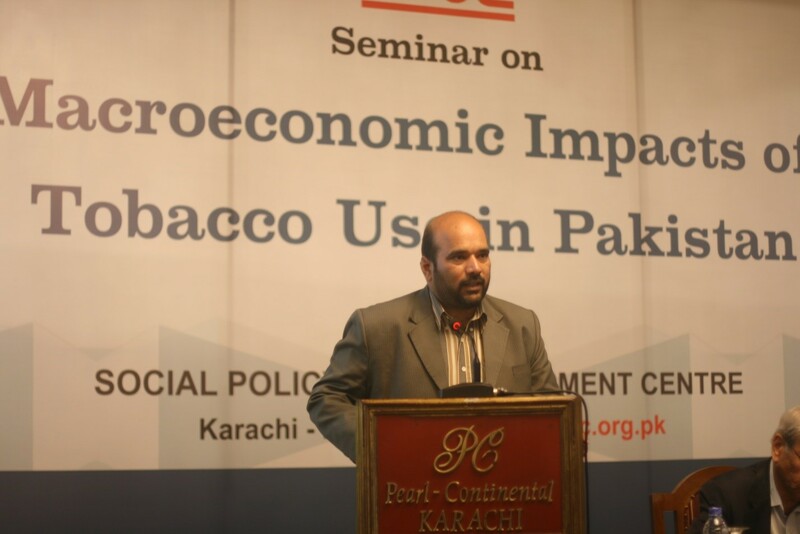 On average, households in Pakistan spend about 3% of their budget on tobacco products. Spending is higher for consumers of cigarettes than for chewed tobacco. Additionally, rural households spend a larger share of their income on cigarettes compared to urban households due to regional price variations and differences in household income earnings. A 10% percent increase in the price of cigarettes will decrease demand for them by 10.7%. A 10% increase in the price of chewable tobacco products will decrease demand by 5.5%. The recent introduction of a three-tiered tax structure and the resulting boost to cigarette sales shows that tax can be an effective tool to reduce tobacco use. A two-tiered tax system with an increased tax rate would improve health outcomes without any significant reduction in government revenues. Moreover, higher tobacco taxes lead to a more pronounced reduction in tobacco use among the poor. Unlike the value-added tax, the primary purpose of the FED on tobacco is to discourage tobacco consumption instead of raise revenue. The impact of increased prices on consumption suggests that the government should set tax increases based on targets to reduce consumption. Tax Administration should use technological solutions for monitoring, enforcement and compliance, as well as devise strategies to break the political influence of the tobacco industry. There is also a need to build social compliance and tax payer morale to promote a dislike for tax evasion and smuggled goods and increase public demand for tax invoices. Until these issues are addressed, performance of the Federal Board of Revenue (FBR) will remain sub-optimal. 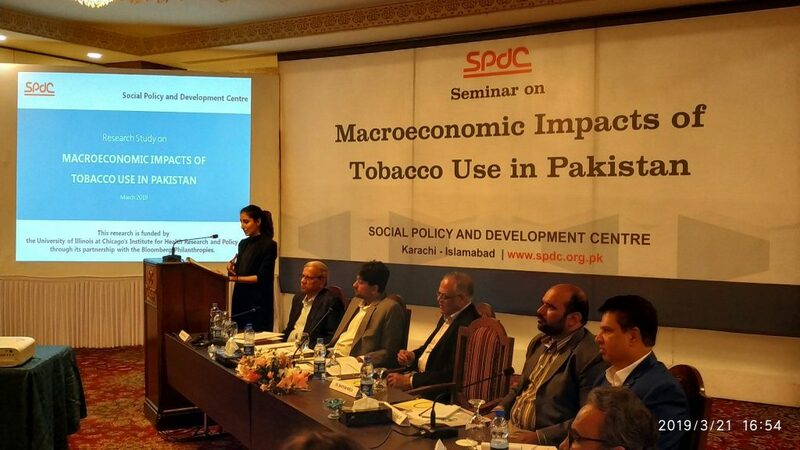 Tobacconomics economist and Pakistan Site Lead, Maryam Mirza giving opening remarks. Next week, you’ll find us in Jakarta, Indonesia, where Tobacconomics think tank partner, PRAKARSA presented their research on illicit trade in tobacco products.